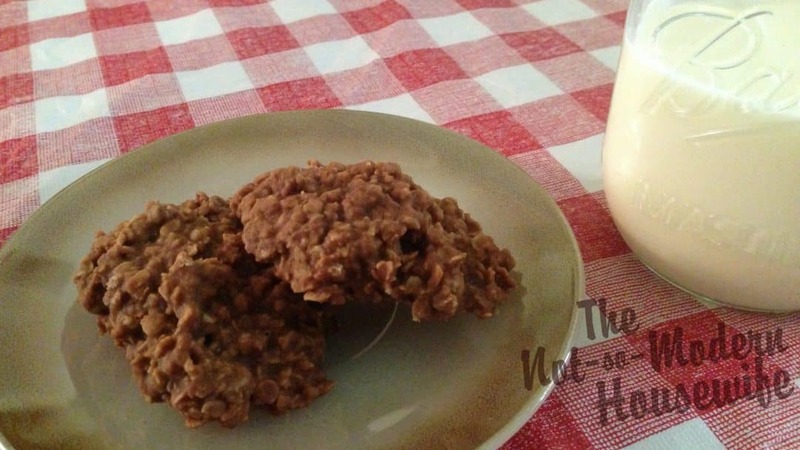 No-bake cookies, the quintessential staple of the school bake sale fundraiser. They are cheap to make and easy enough to enlist the help of the kids. 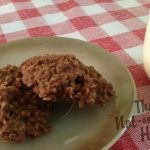 When making these cookies, I realized it’s probably been years since I’ve made or even eaten them. I don’t know why except that it slipped my mind. Now that I have made them, I think I’ll need to make them more often. They were so yummy that they didn’t last long around here. Plus, Farmboy loved dropping spoonfuls on the cookie sheet. And I think Hubby and Farmboy will probably be requesting them on a regular basis. This recipe sets up really nicely and uses ingredients that I keep as staples anyway. No excuse why they can’t be a regular treat. Line two cookie sheets with wax paper. In a medium saucepan, combine the sugar, milk, butter and cocoa powder. Bring to a boil, stirring occasionally. Bring the mixture to a rolling boil and cook for 1 1/2 minutes. Remove from heat and stir in peanut butter, oats and vanilla. Drop spoonfuls of warm batter onto the cookie sheets. Let cool until hardened. The quintessential staple of the school bake sale fundraiser. Line two cookie sheets with wax paper. In a medium saucepan, combine the sugar, milk, butter and cocoa powder. Bring the mixture to a rolling boil and cook for 1 1/2 minutes. Drop spoonfuls of warm batter onto the cookie sheets. I make a version with crunchy peanut butter, but you are right, they are a necessity in any bake sale.